I made a few projects yesterday. I said a few because they were many and all are small projects that I finished them all in just a few hours. First I made an altered notebook, after watching a video tutorial on YouTube by a Swirlydoos Design Team member. HERE is the video. Do catch the video. It's simple but the result is pretty. When I was done with the notebook and waiting for the ink and glue to dry, I went on to alter 3 tiny canvases. 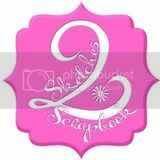 Each are 1 1/2" x 1 1/2" size and just so adorable. 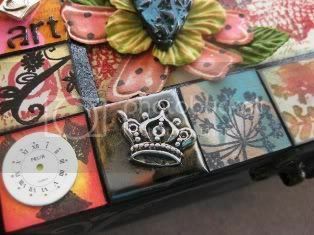 The first canvas, 'YESTERDAY', I spritzed the backgrounds with a few colours of Glimmer Mists and stamped with Tim Holtz Stampers Anonymous stamps. Then I attached a beautiful cameo pendant on the canvas. The second canvas, 'TODAY', I again spritzed a few colours of Glimmer Mists but when it's dried, I stamped the whole thing with embossing ink and sprinkled with clear embossing powder. Once I heat it, it gives a nice slick and shiny effect which I like very much. Then I adhered a felt and word stickers and I was done with it. The last canvas, 'FUTURE', I stamped with embossing ink and sprinkled a few colours of Tim Holtz Distress embossing powder and heat it. Then I stamped with embossing ink again and sprinkled clear embossing powder and heat again. The result is a grainy background but at the same time looks like it's wet with water. Very nice! See how tiny these canvases are. All three fit into the palm of my hand. So cute!! A few years ago, the lovely Aida Haron was in KL to teach a couple of classes. I attended one of her classes on making a 6x6 mini album. Needless to say we spent a lot more chatting and eating than actual scrapping. Good times!! But we did manage to complete the cover of the mini album at least, and went home to finish the inside of the album. Like I said, the class was years ago and the album has been quietly sitting somewhere in my scrap area being ignored as I have been rather lazy for the past year. But I decided to complete the album with photos of our trip to Perth (which was also years ago) and added a few more pages to it. Thank you, Aida. 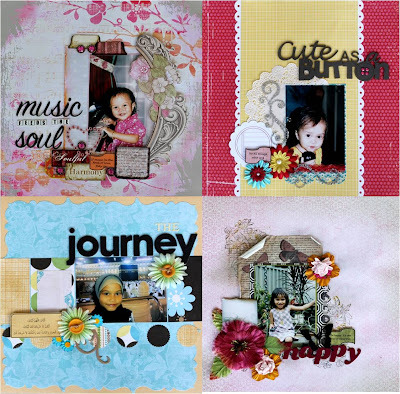 I am proud to say that I have finally completed the album... after many, many years :D.
After making the Pocket Box Mini Album, I still had some papers and embellishment left from my Bo Bunny Gabrielle collection, so I decided to make a layout out of the leftovers. I scrapped a picture of me and my BFF. The picture was taken a few years back which I have in my 'photos to scrap' box. I am determined to scrap all the photos in the box. Wish me luck!! I stamped the background with bubble wrap and acrylic paint to brightened it up a little bit. Although I have to admit that I did it after I've finished the layout. The green of the paper looked a little dull to my eyes and so I decided to do a simple stamping. Thanks for dropping by and have a wonderful day ahead!! 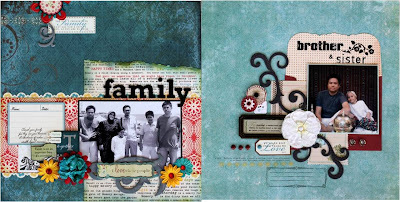 I'm back with a cute little Pocket Box Mini Album which is inspired by Stephanie Miller's Live With Prima tutorial on uStream. You can check out the tutorial HERE and go make one yourself. I decided to put photos of me and hubby on our honeymoon which I had reprinted a long time ago. I'm determined to catch up on my scrapping; using all my old stuff and scrapping everyone of my photos that I had already reprinted. No shopping for new stash!! Instead of Prima stuff, I used Bo Bunny Gabrielle collection to make the mini album. It's so sweet and pretty and I just love the combination of green and orange and brown, with lots of butterflies. Do check out the link and try making one yourself. Thanks for stopping by!! Ok one more layout to update today and I'm done. This layout I made just a few days ago after a tragedy has befallen me and I needed something to do to take my mind off what has happened and concentrate on something else. I am thankful that I have this art that I can escape to and clear my mind even if it's only for a few hours. This is again a simple layout with some stamping and masking and inking. I have to start scrapping regularly again or most of my inks and mists and paints will start to dry up. Wouldn't that be just sad? Last year I was commissioned to make a 10 page 12x12 scrapbook album by a friend of mine. The subject is her very sweet daughter, Mahirah. I enjoyed making this album and it was quite a challenge for me to come out with ideas for the layouts. I was given a free hand with the designs and incorporating a lot of the colour blue because that is Mahirah's favourite colour. She's also such a girlie girl and loves flowers, so that was great for me because so do I.
Hello everyone! Did you miss me? I sure do miss you all. I miss scrapping too of course but just could not find the mojo to start scrapping again. 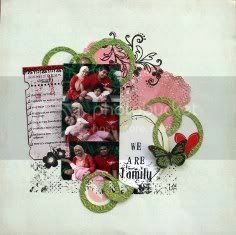 I haven't been doing a lot of scrapping these days but I sure hope to start again and hopefully my mojo cooperates. This is a layout I made some months back. Just a simple layout with a photo of hubby and Nadiah. No special techniques unless you call pasting a skill.. :D. Sometimes less is more.. 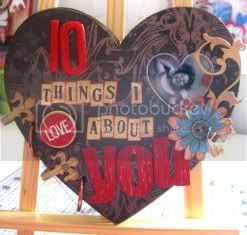 The beautiful flower is from Prima of course and I diecut the scrolls using Tim Holtz dies. I love this quote, and it's so true. Another day, another reveal. Here's a layout that I really, really love making. It's not my usual flowery type kind of layout. Instead I used paper flowers that I made myself. Here's my paper flowers. I love the simplicity of the layout and the grey and pink combo is very nice too. And as usual, I have quotes all over the page. Thanks for dropping by and see you tomorrow!! It's time for another reveal. Again, I made this in February when I was on a scrapping roll. It didn't last very long. Just managed to do 4 layouts and none ever since. This one was a layout about friendship. The girls in the photo are my school mates. Ones that I've known for more than 20 years. Quotes... I can never have enough of them. 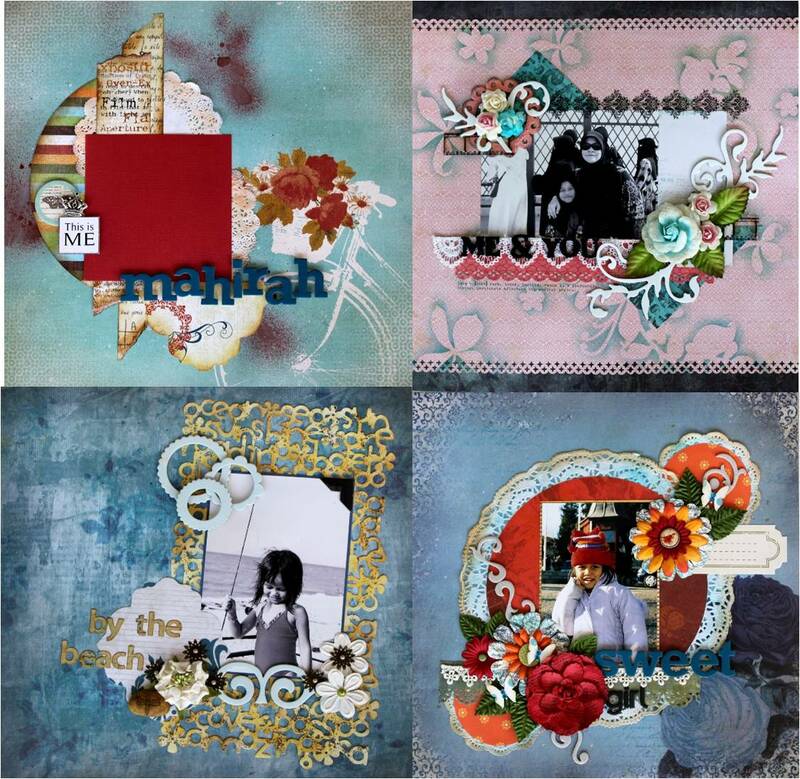 It's a pretty simple layout with mostly misting and pasting and using lots and lots of flowers. You can never go wrong with pretty flowers. So that's it for today. Will be back tomorrow for another layout. Till then... take care and thanks for dropping by. Hi. My name is Yatie. I'm a mother of a 12 year old girl and I love making something beautiful out of nothing. I started scrapbooking about 7 years ago and it has completely changed my world. I also do some beadwork and I love, love, love books. Thanks for visiting my blog!! 3 layouts and guess who is a happy camper? BYOB Bling in my Art Journal!